Georgetown County vital records can be ordered from the Vital Records office of the Georgetown Public Health Department for $12 per search/copy. 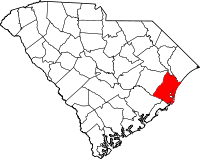 Georgetown instituted county registration in 1883; statewide mandatory registration started in 1915. Records for 1915-present can be ordered only by family members. An unrestricted free online death index (1915-1960) is available on the state Department of Health website, with historical records (1641-1914 births and 1641-1960 deaths) available from the state Department of Archives and History in Columbia. Historical marriage records (pre-1950) are ordered from the Georgetown County Probate Judge while divorce records (post-1949) are ordered from the Georgetown County Clerk.